CHICAGO – Believe it or not, a lot of people heard about some critically acclaimed 2009 films for the first time on Sunday night, when they won or were nominated for 2009 Academy Awards and are now wondering how they can see winning films like “Milk,” “The Reader,” “Vicky Cristina Barcelona,” and shorts like “La Maison en Petits Cubes” and “Toyland”. Let us guide the way. Of course, the big winner of the night was “Slumdog Millionaire,” which does not yet have a DVD/Blu-Ray release date, but you can expect one soon. The film will probably get another expansion in theaters to capitalize on its eight Oscars before a DVD release in probably May or June. “The Curious Case of Benjamin Button,” winner of three awards, didn’t get enough major trophies to get a theatrical expansion, but also doesn’t have a release date yet. Expect it in late April or early May, although they could be putting together a more “special edition,” which would delay till closer to Summer. In the final bit of sad, major winner news, “The Reader” is still playing in theaters, so you’ll have to pay to see Kate Winslet on the big screen or wait a while for the home release. Now for the good news. Three out of the four acting winners are either on DVD/Blu-Ray now or coming soon. 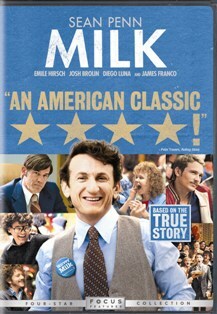 Sean Penn won best actor and Dustin Lance Black won best original screenplay for “Milk” and Focus/Universal has timed that film’s home release perfectly, bringing Gus Van Sant’s masterful film home on March 10th, 2009. 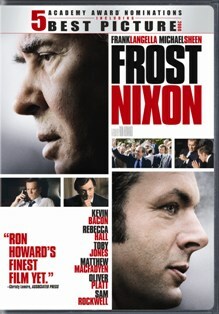 Universal also holds the DVD rights to the fifth best picture nominee “Frost/Nixon”. 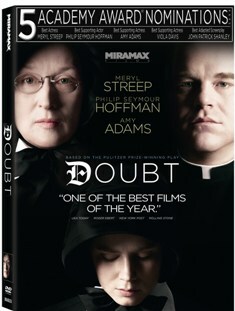 The Ron Howard film will be released on DVD and Blu-Ray on April 21st, 2009. Both supporting award winners were already available at DVD stores. You can catch Penelope Cruz’s work in the great “Vicky Cristina Barcelona” and Heath Ledger’s in the amazing “The Dark Knight” now. You’re not a movie fan if you haven’t seen them both. The question I was asked the most on Sunday night was how to see the Oscar-nominated and winning short films. Most are all available on iTunes for $1.99 a piece. Sadly, the deserving and gorgeous animated winner, “La Maison en Petits Cubes,” is not available. But there’s still a few shorts worth checking out. Start with the winning and touching “Toyland”. If you want to see more deserving nominees, the animated “This Way Up” is totally worth the time and live action “Auf Der Strecke (On the Line)” & “Manon on the Asphalt” are both better than the actual winner, in my opinion. And better than “The Reader”. Of course, the most Oscar-nominated animated film of all time and the winner in its specialized category, “WALL-E” has been available on DVD and Blu-Ray for a while now. If you’re thinking about upgrading to Blu-Ray and HD, “WALL-E” may be reason enough. It’s beautiful. The winner for best documentary, “Man on Wire” is also available on DVD and Blu-Ray, but the foreign language film winner, “Departures,” hasn’t even played in most domestic markets. Good luck tracking that one down, although its win should get it a wider theatrical release than it otherwise would have received. Finally, the winner for best costume design, “The Duchess” has been available on DVD and Blu-Ray for a few months. To recap the big winners - “WALL-E,” “The Dark Knight,” “Man on Wire,” “The Duchess,” and “Vicky Cristina Barcelona” are all at your local video store. “Milk” will be released on 3/10/09. We’re waiting on release dates for “The Curious Case of Benjamin Button,” “The Reader,” and “Slumdog Millionaire”. As for nominees on DVD and Blu-Ray, you can also check out “The Visitor,” “Changeling,” “Frozen River,” “Tropic Thunder,” “In Bruges,” “Kung Fu Panda,” “Encounters at the End of the World,” “Hellboy II: The Golden Army,” “Iron Man,” and “Wanted” today if you want. As for upcoming nominees, “Australia” comes home on March 3rd, 2009, “Rachel Getting Married” and “Happy-Go-Lucky” will be released with “Milk” on March 10th, 2009 (call it “Oscar DVD Day”), “Bolt” will be in stores on March 22nd, 2009, “Doubt” will hit stores on April 7th, 2009, and “Frost/Nixon” comes out on April 21st, 2009. Submitted by Anonymous (not verified) on March 2, 2009 - 12:51pm. Overall, it was a great night for an evening of wonder and entertainment for many.